Elizabeth has been with the Community Foundation of Orange and Sullivan County since 2013 and currently serves as the President and CEO. She works with the Board of Directors, professional advisors and volunteers to plan, structure, implement and monitor an effective development program that will increase endowed and non-endowed assets, develop and maintain good relationships with nonprofit organizations, and steward current and prospective donors. During her time with the Foundation, charitable assets have grown to over $28million, with nearly $10million in charitable grants and scholarships from their 270+ funds being distributed back into the community since inception. Elizabeth is an Orange County native with a strong background in development, marketing and the nonprofit sector, having worked at Inspire – Orange County Cerebral Palsy Association and the Town of Wallkill Boys & Girls Club prior to joining the staff at the Community Foundation. She is a 2004 graduate of Emerson College with a degree in Marketing Communications. Elizabeth is a 2008 graduate of Leadership Orange and obtained her Certified Fundraising Executive certification in 2014. She serves as the Immediate Past-President of the Mid-Hudson Valley Association of Fundraising Professionals, is a Sustaining Member of Junior League of Orange County, a member of the Board of Directors of Safe Harbors of the Hudson, a Trustee on the Orange Regional Medical Center Foundation and a member of the Hospice of Orange and Sullivan Auxiliary. She currently resides in Newburgh with her husband Bill Fioravanti and their daughter Mira. Louis joined Sterling Forest LLC as President in January 1990. In August 1994, he was appointed Chairman and CEO. Prior to that, his 12 years as County Executive of the County of Orange was a record of continual accomplishment. His ability was affirmed by the fact that he was re-elected twice to the position, serving a full three terms. Prior to his election as County Executive, he served three terms as Supervisor of the Town of Wallkill. Louis has a Bachelor of Science and an MBA from Cornell University. His associations include Chairman, Stewart Airport Commission; Board Member, Hudson Valley Economic Development Corporation; Board Member, Orange County Citizens Foundation; Board Member, Warwick Historical Society; Past Chairman, Orange Regional Medical Center; Past Board Member and Past Chairman, Orange County Capital Development Corporation; Former President, Orange County Association of Supervisors and Mayors; Former Member, Builders Association of the Hudson Valley; Former Member, NY Committee for Employer Support of the Guard and Reserve; Former Member, Urban Land Institute; Past Chairman of Patterns for Progress; Member, Orange County Chamber of Commerce. LEGOLAND New York will open in Goshen in 2020. The resort will cover more than 150 acres and feature over 50 rides, shows, and LEGO-themed attractions. 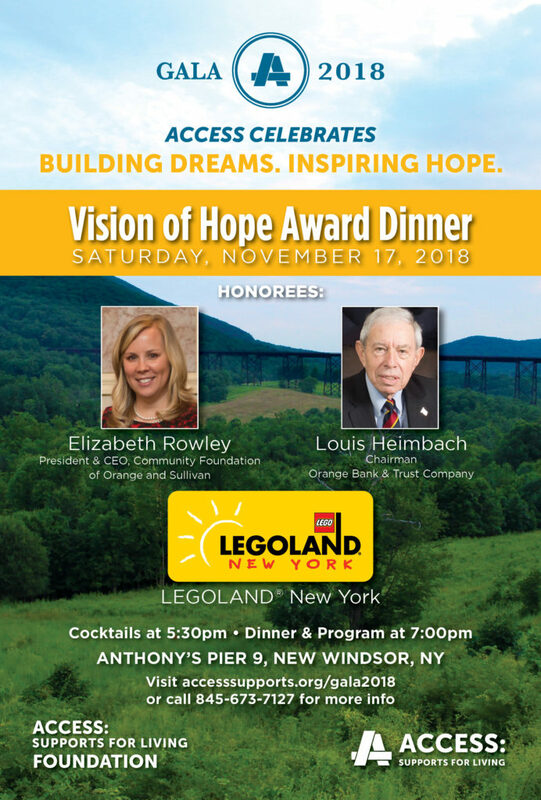 The organization enhances the economic development of the Hudson Valley while creating magical experiences in the lives of children of all abilities and their families through their foundation, Merlin’s Magic Wand. Merlin Entertainments plc is a global leader in location based, family entertainment. As Europe’s number one and the world’s second-largest visitor attraction operator, Merlin now operates more than 120 attractions, 15 hotels and six holiday villages in 25 countries across four continents. The company aims to deliver memorable experiences to more than 65 million visitors worldwide, through its iconic global and local brands, and the commitment and passion of its 29,000 employees (peak season).